1. CapitaLand – CapitaLand is the leading property developer in Singapore but third in the whole of Asia. Its market capitalization is US$11.10m with a market share of 20.7. The original focus of the company is development in Singapore and China but it expanded to Australia and Europe. 2. Global Logistics Properties – GLP is known for its large and efficient logistics network. It is present in 33 major cities in China, Japan and of course Singapore. Its market capitalization is US$10.4m with a market share of 18. 3. City Developments Limited – CDL is involved in various real estate development and investment with hotels and management facilities. Its market capitalization is US$8.2m with a market share of 14.3. 4. CapitaMalls Asia – CapitaMalls has incorporated shopping mall business, real estate and asset management. Its market capitalization is US$6.1m with a market share of 10.7. 5. Keppel Land – Keppel has various interests in marine, property investment and infrastructure. Its market capitalization is US$4.9m with market share of 8.5. 6. UOL Group – UOL has various residential apartments, offices, malls, hotels, spas and restaurants. Its market capitalization is US$4.3m with market share of 7.5. 7. 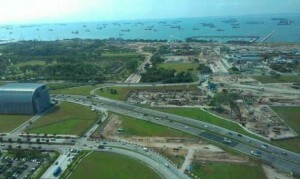 Singapore Land – SingLand has office spaces, retail spaces, hotels, shopping, etc. Its market capitalization is US$3.04 with market share of 5.3. 8. Overseas Union Enterprises – OUE has residential and hotel developments. Its market capitalization is US$2.24m with market share of 3.9. 9. Wheelock Properties – Wheelock has several properties like Sea View, The Cosmopolitan, Ardmore II, Orchard View, Ardmore 3, etc. Its market capitalization is US$1.9m with market share of 3.2. 10. Bukit Sembawang Estates – Bukit Sembawang Estates focuses on property related activities. Its market capitalization is US$1.5m with market share of 2.6.